"Congress's chief budget analyst delivered a devastating assessment yesterday of the health care proposals drafted by congressional Democrats," the Washington Post reported Friday, but of the broadcast network evening newscasts on Thursday only ABC's World News related how, as Jake Tapper put it, "the President's case was dealt a blow today" when CBO Director Douglas Elmendorf warned the health plans will require massive additional spending. Noting "House Democrats would impose a surtax of up to 5.4 percent on top wage earners," Tapper relayed how the Tax Foundation determined it "would push top tax rates to over 50 percent in most of the country. That has moderate House Democrats concerned." Tapper pointed out that "if the President signed the House bill into law, which he has not ruled out, he would be breaking this campaign promise." Viewers then saw a clip of Obama from last September: "Everyone in America, everyone, will pay lower taxes than they paid in the 1990s under Bill Clinton." Setting up Tapper's piece, ABC anchor Charles Gibson had led with good news for President Obama: "President Obama is a man on a mission. Everywhere he goes these days, he's pushing health care reform. He got a boost today. The American Medical Association said it supports it - supports the House Democratic bill, that is. The AMA says that version of health care reform expands coverage but still gives patients a choice of plans." Tapper concluded by citing another ally for Obama: "You may recall those Harry and Louise TV ads that helped sink health care reform 15 years ago. Harry and Louise are back in new ads, but this time, courtesy of the pharmaceutical industry, they're in favor of reform." Neither the CBS Evening News nor NBC Nightly News ran a health care story on Thursday night. CHARLES GIBSON, TEASE: Tonight, at what cost? Health care reform plagued by critical questions. Who will pay for it? Will it save money? And most importantly, does it have enough support? GIBSON: Good evening. President Obama is a man on a mission. Everywhere he goes these days, he's pushing health care reform. He got a boost today. The American Medical Association said it supports it - supports the House Democratic bill, that is. The AMA says that version of health care reform expands coverage but still gives patients a choice of plans. But on Capitol Hill itself, there's a growing sense of caution. Some members of Congress telling the President to slow down, don't push so hard. Jake Tapper is at the White House again tonight. Jake? JAKE TAPPER: Good evening, Charlie. Well, two key moderate Senators were frank with the President today, telling him that they thought his deadline to have health care reform legislation passed by the August recess was arbitrary, and would not necessarily result in the best product. But the President is determined, and for him, it's full speed ahead. At a rally in New Jersey this afternoon, President Obama continued his health care reform push. PRESIDENT BARACK OBAMA: The health care debate is starting to heat up. 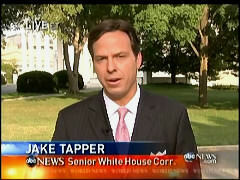 TAPPER: The President said containing health care costs is essential. OBAMA: The price of doing nothing about health care is a price that every taxpayer and every business and every family will have to pay. TAPPER: But the President's case was dealt a blow today when the head of the Congressional Budget Office said Democratic health care legislation in the Senate will not reduce the government's health care costs - which the President has said is vital. DOUGLAS ELMENDORF, CONGRESSIONAL BUDGET OFFICE: On the contrary, the legislation significantly expands the federal responsibility for health care costs. TAPPER: The administration said that bill is just one of three Democratic bills working their way through Congress and does not account for the savings that they hope to achieve through Medicare and Medicaid. But how to pay for reform is the big conundrum right now. House Democrats would impose a surtax of up to 5.4 percent on top wage earners, which a study by the non-partisan Tax Foundation said would push top tax rates to over 50 percent in most of the country. That has moderate House Democrats concerned. REP. JIM COOPER, (D-TN): The tax increases on small businesses and upper income people is worrisome because you don't want to hurt job creation at a time like this. TAPPER: And if the President signed the House bill into law, which he has not ruled out, he would be breaking this campaign promise. BARACK OBAMA, SEPTEMBER 12, 2008: Everyone in America, everyone, will pay lower taxes than they paid in the 1990s under Bill Clinton. TAPPER, SITTING AT A WHITE HOUSE PRESS CONFERENCE: My understanding is that the House bill would raise them even higher than that. ROBERT GIBBS: Well, the - we're going to watch the process unfold. TAPPER: The President has ruled out an idea endorsed by many Senators, to tax health care benefits, arousing the consternation of the Chairman of the Senate Finance Committee today. SENATOR MAX BAUCUS (D-MT): Basically, the President is not helping us. He does not want the exclusion. That's making it difficult. TAPPER: One other thing, Charlie. You may recall those Harry and Louise TV ads that helped sink health care reform 15 years ago. Harry and Louise are back in new ads, but this time, courtesy of the pharmaceutical industry, they're in favor of reform.